B&B in other Kerry Towns: Click on a town below. Waterville (An CoireÁn) "The Little Whirlpool", is the premier coastal tourist centre, with blue flag beaches, on the Ring of Kerry. It has attracted many celebrities through the years including Charlie Chaplin & family. 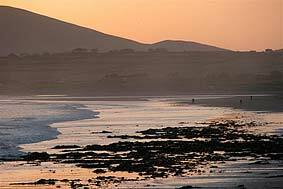 Waterville nestles between Balinskelligs Bay & Lough Currane, you will find mountains & lakeland with the added advantage of the sea on your doorstep. Traditional fairdays or market days are still held on the streets where young and old, visitors and locals meet and chat. A visit to Waterville ensures intimate bars, superb food and a wide range of shops. "One wonders in this place why anyone is left in Dublin or London or Paris, where it would be better one would think - to live in a tent or hut with this magnificent sea and sky and to breathe this wonderful air - which is like wine in ones teeth"
Its golf course, Waterville Golf Club, is rated one of the best links courses in the world and has been played by many the worlds top golfers. They include Tiger, Els, Furyk, O'Meara, Snead, Faldo, Player, Floyd and Stewart. Payne Stewart accepted the Captaincy of Waterville; the last golf honour he would receive before his unexpected death. Other celebrities who have played the course include Michael Douglas & Katherine Zeta Jones. Although a small seaside town accommodation is interesting and varied. It ranges from several hotels, one a 4 star, to guesthouses, B&B family homes and selfcatering holiday homes. Bed & Breakfast can be had at these establishments and traditional Irish breakfast is always on offer.